During the First World War the Argentinean government granted permission for the northern half of Tierra del Fuego to be divided up into new estancias. One of the first companies to take advantage of this was the Menendez Behety combine of Punta Arenas, already involved in estancias, coastal shipping and a variety of other businesses on both sides of the border. Two huge new estancias - Primera Argentina and Segunda Argentina - were laid out, south and north of the Rio Grande respectively, westward from the town of Rio Grande all the way to the Chilean border. On the death of the founder of the company these two estates were renamed after José Menendez and his wife Maria Behety. The new estancias, and older ones such as the historic Est. Viamonte to the south, obviously needed a slaughterhouse and freezer plant. A co-operative, 'the Compañia Frigorifica Argentina de Tierra del Fuego, embarked on the construction of a frigorifico on the south side of the Rio Grande near the sea, just opposite the town of the same name. The frigorifico, in 1940 sold to CAP (Corporación Argentina de Productores de Carnes) is now empty and derelict. The view below shows it as seen from the opposite side of the river. Its jetty or muelle is visible on the right. Within a small area there were two railway systems at this location. The frigorifico itself had a 60cm. gauge system which ran out onto the muelle, whilst the Estancia Primera Argentina (later Est. José Menendez) built its own longer metre gauge line down to the port. The co-operative constructing the frigorifico in 1917-8 was granted permission to import free of duty a railway, to facilitate movement around the plant as well as to link it to the nearby muelle (1). The system was 60cm. gauge, perfectly adequate for a works network and capable of coping with sharp curves within the buildings. The muelle survives (below), and is labelled as a monument. It can be seen that it has two railway tracks, clearly of 60cm. rather than one metre gauge. The river bank being steep, the muelle is relatively short. The 60cm. system had at least one locomotive, a German 0-4-0T as seen in the photo below (2). Reg Carter's Argentinean industrial locos list says that this loco was a Koppel product from Berlin but does not give a builder's number (3). Martin Murray's preserved Koppel locos list suggests it may be no. 3741. 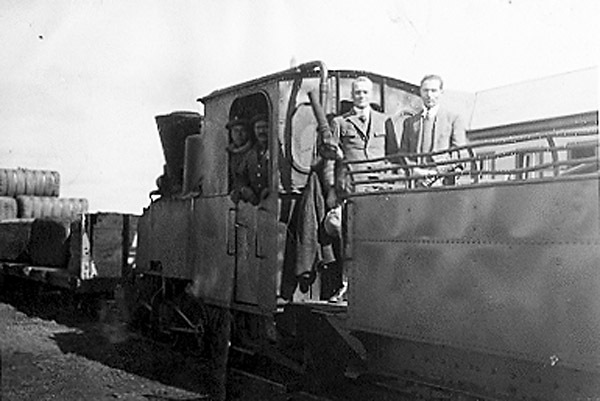 This engine is reported to have been salvaged later, after the closure of the system, and to have been taken north to Republica de los Niños at Gonnet near La Plata (2). Confusingly, a couple of relics of the 60cm. gauge lie amongst other antiques at Estancia José Menendez. It should be emphasised that the estancia never used 60cm. gauge itself. The Menendez Behety group was already experienced in the operation of an estancia railway (at Est. San Gregorio) when the new Argentinean estancias were laid out. Each of the latter stretched for 30 miles or more, and had up to 200,000 sheep on an area approaching 300,000 acres. The idea of constructing a railway to the new muelle next to the frigorifico probably cropped up early therefore. However, whilst the Est. Primera Argentina was south of the river - on the same side as the muelle - Est. Segunda Argentina was on the opposite side and did not lend itself so easily to railway transport. 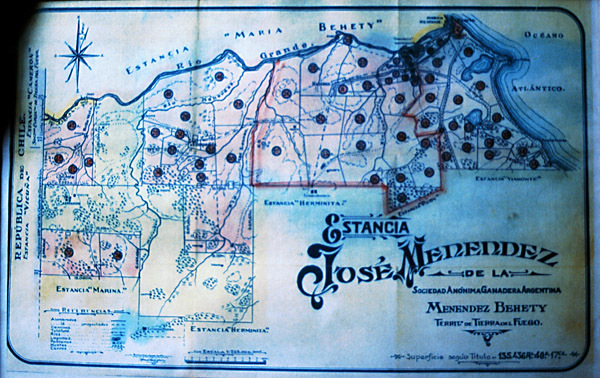 The map below shows Estancia José Menendez (ex Primera Argentina). The Atlantic Ocean is to the right, with the Rio Grande forming the northern boundary and dividing it from Est. Maria Behety (ex Segunda Argentina). The straight line to the west is the Chilean border and to the the south the more irregular boundary is with older estancias such as Est. Viamonte towards the coast. The estancia's buildings are in the north east sector, just south of the river and roughly under one of the vertical folds in the map. From there the railway is a black line running north east towards the river mouth. In 1996 the Menendez group pulled out of Argentina and the estancia was divided up at that time (4). The new smaller estate has been marked with a red boundary on the map. A metre gauge railway was constructed from the shearing shed (galpón de esquila) at Estancia Primera Argentina eastwards and generally downhill to the frigorifico 12km away. 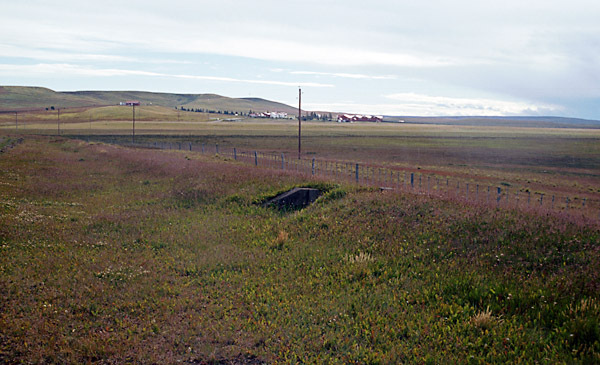 The line was of solid construction, largely on a low embankment, and with concrete and steel culverts. The rails were substantial - about 35-40 lbs per yard, on steel sleepers. The choice of metre gauge, when the frigorifico already had 60cm gauge, is intriguing. The lines at San Gregorio and other frigorificos in Chile were all of metre gauge, but there may also have been thoughts of later extension, to Est. Segunda Argentina or elsewhere. It may have been felt that 60cm. gauge would be less suitable for a larger network. 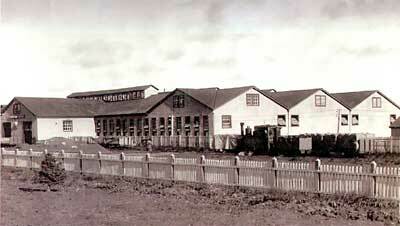 The photo above shows a modern view of the estancia's shearing shed. 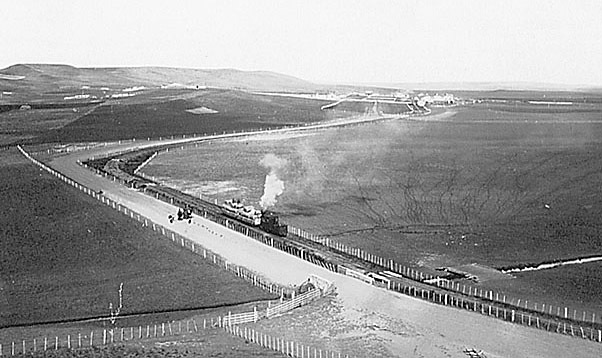 The railway started along the front of this as shown in the older photo below (5). A locomotive is shown with its tender but there are also two wagons and clearly must have been two or more lines of track running parallel here. 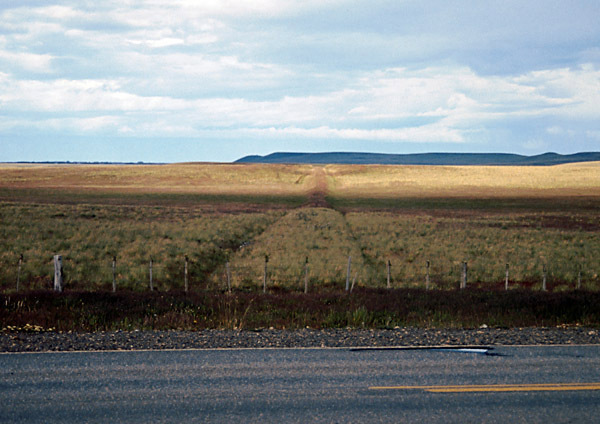 The line then ran off to the right parallel with the estancia access road, as shown in the photo below. This is the first of several kindly provided by Ann Munro through the good offices of Duncan Campbell's 'Patbrit' website. Two wagonloads of baled wool are seen being taken down to the muelle by a steam loco running tender first. Unusually there seems to be no barrier wagon between loco and load. Below are three modern pictures of the line's earthworks. The first shows a culvert, probably one of the two visible in the photo above. The estancia buildings are in the background. 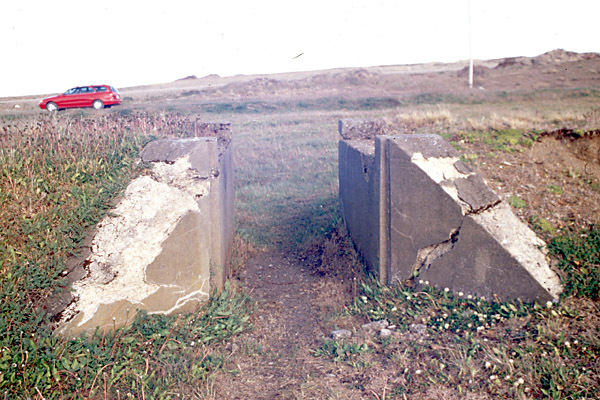 A closer view of a set of old abutments, as seen in 2000. After crossing National Route 3 on the level, the track continued north east on a low embankment. 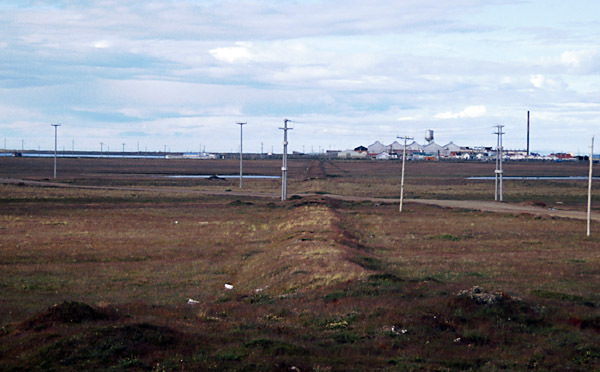 A short section of the line has been buried under landfill, but the final half-mile is again on a low embankment until it crosses the road to the frigorifico (in background) and ends at a transhipment platform parallel with the 60cm gauge along the waterfront. 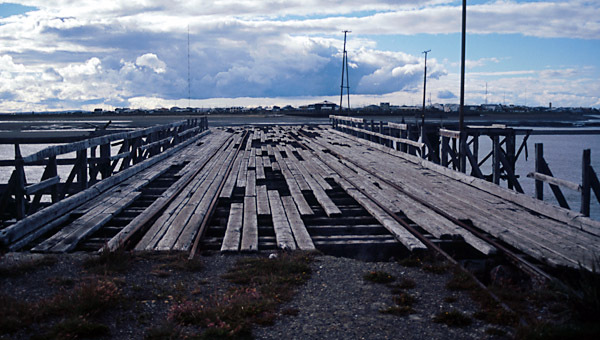 There are no signs that the metre gauge tracks ever ran onto the muelle itself. The resulting extra handling must have been awkward, and expensive in time and manpower. • FC de la Estancia Primera Argentina A flight along the route from the estancia to the muelle at the frigorifico. "Fly-throughs' on such long routes as this one can be extremely tedious unless the Google Earth preferences are set to a fairly high speed. If looking for a particular location you might be better advised to click on a named placemark. However, the monotony of following the trackbed across the bare pampa for many miles does at least give a clear impression of the problems of making such a railway pay its way. The locomotive seen below is considerably more substantial than the frigorifico engine, though it is clearly also of German origin. Whilst the wheels cannot be seen clearly it appears to be an 0-6-0 side tank but with a purpose-built six-wheeled tender for firewood and perhaps for more water. To match the neatly labelled warehouse, the engine is also painted with the estancia name. There appears to be a small spark arrestor on the chimney, appropriately in view of the wood fuel. 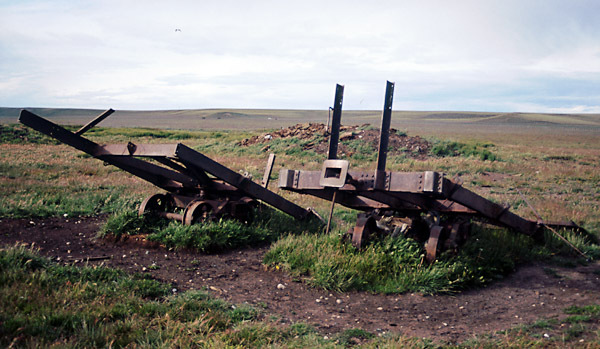 It has been suggested that there were three locomotives in total at Rio Grande (1), but there is no indication as to whether it was the frigorifico or the estancia which had two. 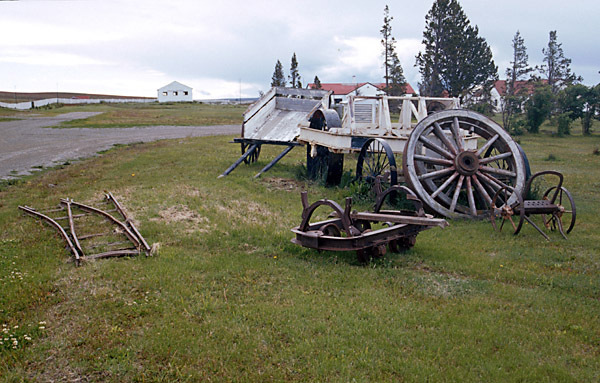 It seems unlikely that the estancia would have needed two engines regularly except during the shearing season, whilst the frigorifico would have been working all year round. The above photo was probably taken at the frigorifico and port end of the line, outside what seems to be the estancia's own warehouse. 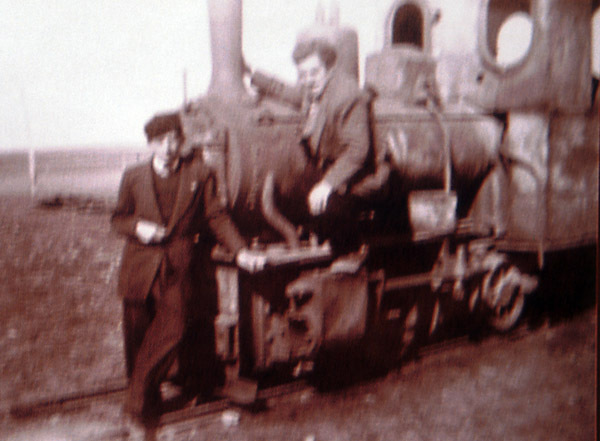 Two more photos (provided by Ann Munro) of what is probably the same engine, though now with a spark-arresting chimney. This implies the use of wood fuel, rather than oil as has been suggested. The picture above (5) shows a pair of the line's 'plataforma' wagons for carrying bales of wool. It has been suggested that there were just a dozen of these. 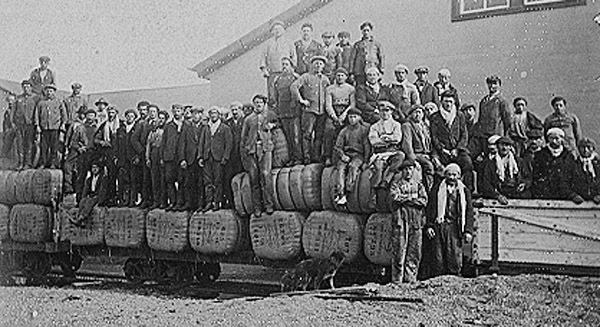 The second wagon appears to be carrying such bales whilst that nearer the camera has smaller sacks as well as its human cargo. Like the loco further up the page the wagons all seem to be clearly labelled - in this case with 'E J M' on the ends for 'Estancia José Menendez'. 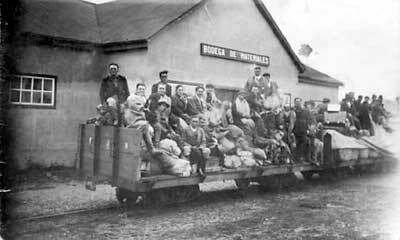 The estancia's shearing gang pose for their picture atop wagons loaded with wool (above). The wagon to the right seems to have been a barrier wagon, perhaps to keep the locomotive away from the inflammable bales (though wool itself does not burn readily). 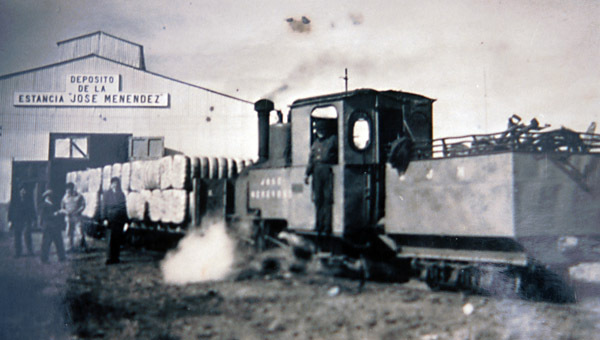 In contrast, the picture below shows a loaded wool train in the same location outside the galpon de esquila but with no barrier wagon. A similar photo, though with four loads of wool and an empty wagon next to the loco possibly as an anti-fire-risk barrier wagon. One of the wagons survives today, albeit in two halves! The picture below was taken in January 2001 at the estancia rubbish dump. It shows a bogie flatcar with diamond (archbar) trucks and link and pin couplers. Whilst it has been cut in two, it would not be impossible to rejoin the halves if it were to merit display either in the estancia or in the town museum. 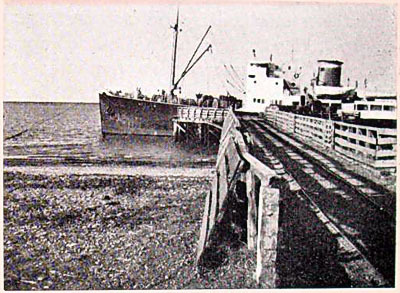 The railway closed at the end of the war, in about 1945. A local historian, Oscar Domingo Gutierrez, suggested that the rails, wagons and loco had then been used in the construction of Rio Grande's aerodrome, and that the rails and wagons, but not a loco, had gone on to be used in the early 1950s when the town was constructing a new 'acueducto' or water supply. As suggested above, the trackbed is clearly visible even now. Apart from the derelict wagon other relics are limited to a number of steel sleepers and rails piled up by the shearing shed. The eventual end or destination of the locomotive is unknown. This was the other of the two initial estancias set up by the Menendez-Behety group, and was originally known as Estancia Segunda Argentina. Whilst it had no railway as far as we are aware, the following photo, kindly supplied by David Guevara of Rio Grande, shows the alternative means of transport for wool bales. 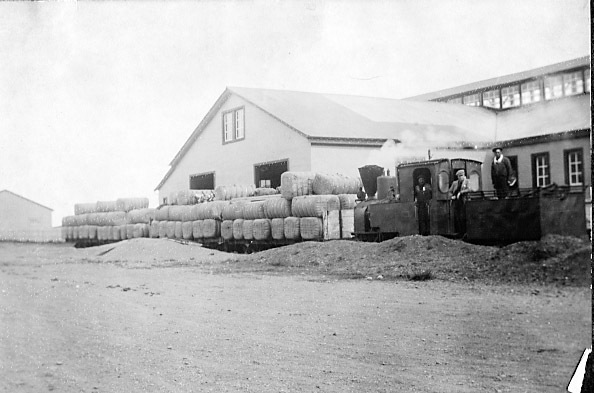 An 8 or 10hp McLaren road loco hauls two trailers laden with wool bales outside one of the buildings at Estancia Segunda Argentina (6). The machine is superheated, as evidenced by the strange shape of the smokebox, and seems to have covers over the motion, perhaps to keep out the dust. Regretably the building was later destroyed by fire. 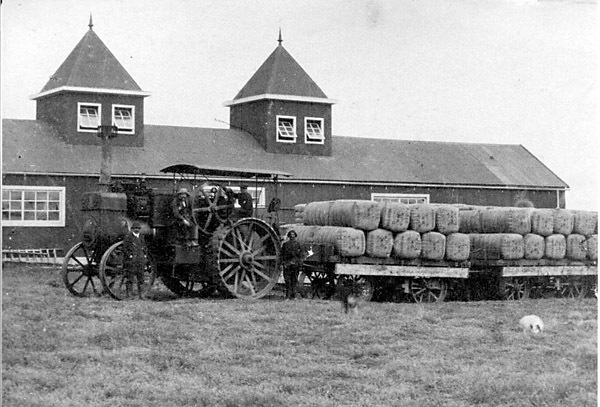 The fate of the road loco is not known, however, a Ruston Procter wool bale trailer similar to that shown here survives at Est. María Behety to this day. The town of Rio Grande has a public muelle on the north side of the river, opposite the frigorifico muelle. There is also a more modern one facing the open sea further north. This photo apparently shows a public muelle at Rio Grande, probably around 1940 (7). It bears a single narrow gauge track. 1 Notes from Oscar Domingo Gutierrez, Rio Grande. 2 Río Grande, Patagonia, Argentina. 1997? A history of Rio Grande with photographs provided by Señor Domingo Gutierrez. Casa Editorial Jorge Rossi. 3 Industrial Locomotives of Argentina. Revised edition 1998. Reg Carter. 4 Interview with David Thomson, manager of the estancia, January 2001. 5 Photos kindly provided by Oscar Domingo Gutierrez. 6 Identification of the engine is by Richard Morris of Worcester, England. 7 Photo discovered in Tierras Australes, Jerónimo Gómez Izquierdo, published by Empresa Editorial Bell, Buenos Aires,1942, page 147, and kindly forwarded by Señor Diego de Bunder of Puerto Madryn.